Photo by Andrej Uspenski, Courtesy Beatriz Stix-Brunell. Beatriz Stix-Brunell is standing in front of the choreographer Christopher Wheeldon, frowning intently. It is early March at The Royal Ballet in London, and just one day before she is due to make an unexpected debut in the title role of his Alice's Adventures in Wonderland, replacing the injured Marianela Nuñez, one of the company's most acclaimed ballerinas. As if that weren't enough pressure, The Royal Ballet is streaming class and rehearsals live online all day, with four camera crews moving between studios. Wheeldon is fine-tuning (in front of a “worldwide online audience," as he jokingly puts it) the first step of one of Alice's solos. It's an arabesque renversée, in which she must balance for a split second after the turn, before stepping gracefully backwards and repeating the step. After watching Stix-Brunell perform the sequence, Wheeldon gets out of his chair. “Think of somebody taking your arabesque foot and pulling you back," he tells her, demonstrating the openness and breadth he wants for the movement. Stix-Brunell nods briefly and tries again. It's a perfect, dreamy fall, arms floating down with exquisite airiness as she turns out of the arabesque. “Beautiful," says Wheeldon. “Just three of those would be nice." Most talented ballet dancers follow a predictable school-to-company route. Not Beatriz Stix-Brunell. Currently in The Royal Ballet’s corps, she has carved out an unconventional—and already high-profile—career path. Hooked on the purity of the POB style, Stix-Brunell sought out master teacher Fabrice Herrault, a POBS alum, when she returned to New York. They began a demanding training regimen that combined Herrault’s classes at Steps on Broadway with private lessons. 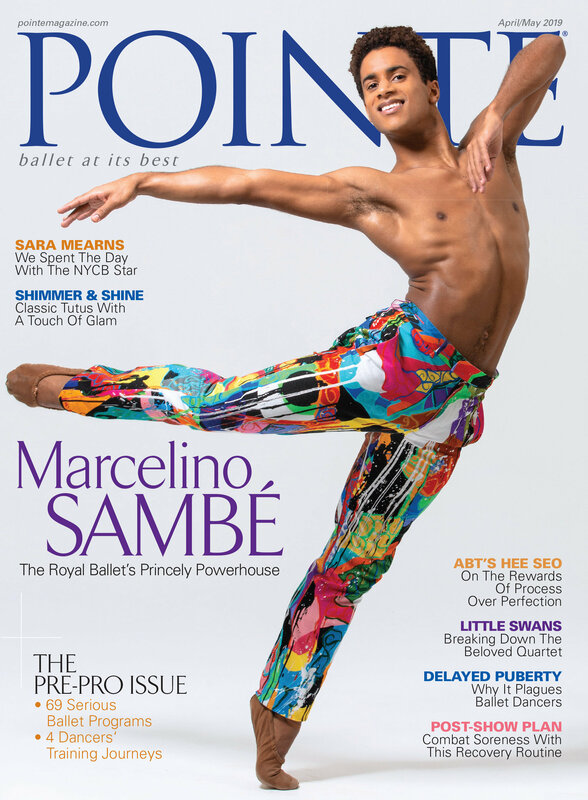 “Fabrice taught me that there are no tricks in ballet,” Stix-Brunell says. “He’d compile footage for me of Anna Pavlova, Mikhail Baryshnikov and Gelsey Kirkland. And he’d explain that they all made it by working extremely hard.” Though Herrault proved a trusted mentor, Stix-Brunell decided to return to SAB in her junior year to accommodate her academic schedule at a private girls’ school. But she continued classes with Herrault, “to keep up my classical work,” she explains. All of Stix-Brunell’s training choices show a bright, inquisitive mind, and they’ve resulted in an unmannered technique that’s the perfect canvas for both classical and contemporary work. It didn’t take long for people to notice. Christopher Wheeldon put Stix-Brunell on the professional map when he asked her to join Morphoses, then under his direction, when she was just 15. “She was a rose in the room,” Wheeldon says of her audition. “Even at such a young age, she had an intelligent approach to the work.” Stix-Brunell held her own performing alongside seasoned professionals from New York City Ballet and The Royal Ballet. “I treated her like one of the gang, and she got on with it,” Wheeldon says. “Before long, Maria Kowroski was giving her makeup tips.” It was a fairytale story, and Vogue and New York magazine wasted no time printing it. Suddenly Stix-Brunell was, by ballet standards, a household name. The young dancer took her newfound fame in stride—and kept her eyes wide open as she toured with Morphoses. “When we were performing at Sadler’s Wells in London, we took class with The Royal, and it was like love at first sight,” she says. “The dancers were gorgeous. I thought, ‘I have to pursue this.’” She began an email exchange with director Monica Mason that resulted, by the spring of 2010, in Stix-Brunell’s corps contract with The Royal—no audition required. Every ballet student dreams of dancing new works with a world-class company. But for Beatriz Stix-Brunell, that dream came true a little early. About a year ago, Christopher Wheeldon picked the 16-year-old wunderkind to dance in his elite troupe, Morphoses/The Wheeldon Company. Stix-Brunell, who trains with renowned instructor Fabrice Herrault in New York, has found working with Morphoses to be an invaluable—and heady—experience. Just a few years ago, she watched New York City Ballet principal Wendy Whelan perform Wheeldon’s Polyphonia; last fall, she danced in the piece with Whelan during Morphoses’ season at New York City Center. And Stix-Brunell was part of the original cast of Wheeldon’s Commedia, along with the likes of Royal Ballet principal Leanne Benjamin and freelance star Drew Jacoby.